Hi, my name is Cara and I'm addicted to kombucha. Kombucha is fermented tea. It is fermented using a symbiotic colony of bacteria and yeast (called "SCOBY"). It is thought to have originated in China in 212 BC and was referred to as the "tea of immortality" during the Chinese Tsin Dynasty. It's gained popularity in the U.S. and can be seen on the shelves of health food stores and now, you can even find it in your regular 'ol supermarket. Well, duh. It's the tea of immortality. OK, maybe that's a stretch. But kombucha is said to detoxify the body. I like it because it makes me feel good and it's tasty. It's fermented. Is there alcohol in it? There are trace amounts of alcohol but I once read that you'd have to drink something like 50 kombuchas to be tipsy. So why make your own kombucha? I've been drinking one bottle of kombucha a day for a few months now, which can be expensive. I've found that Natural Grocers has the best price, but even then it's $2 per bottle. When I found out from my friend Alexiss that I could brew my own for a one-time investment of twenty-ish dollars and then next to nothing after that, I was sold on the idea. I picked up this kit at Natural Grocers for a whopping $11. It included the SCOBY, raw kombucha and black tea. 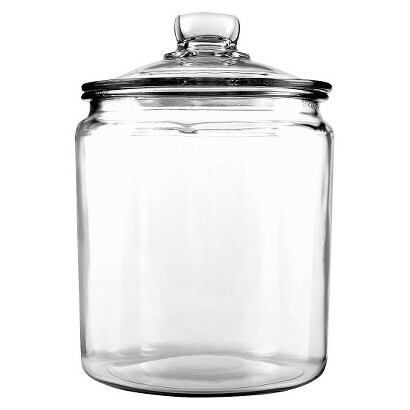 Then, I purchased this one-gallon glass jar at Target. It was only $7. The nice thing about the kit was that it included all the instructions. Which were super simple. I brought a pot of water (1 gallon) to a boil and added the black tea bags, removing from the heat. Next, I added the sugar to dissolve. Then you let this cool down before moving on. This is important, according to my handy directions. Once the tea has cooled to room temperature, remove the tea bags and dump your tea into your glass jar. Add the SCOBY and unflavored kombucha. Cover the jar with cheesecloth or fabric, secured with a rubber band. Place this in a temperature-controlled environment (not too hot, not too cold — kombucha likes it Goldilocks-style) where you won't move it. Kombucha also likes to be left alone. Then you wait. You can wait 7-30 days, depending on how fermented you like it. I waited 10 days for my first batch. It was really good, but I prefer it a little more fermented. This next batch I'm waiting a little longer. You can taste test it until it's how you like it. I was just paranoid the first time. Once your tea is fermented to your liking, remove the scoby and reserve 1 cup of your kombucha — you'll need these for your next batch of kombucha. That's it! Store it in the refrigerator and drink up! NOTE: Eventually, your SCOBY will multiply and you can brew more than one batch at a time, or share a SCOBY with a friend. Kombucha for everyone!